A solar panel can be seen on the roof of Jean-Marie Ngandu’s barber shop at the Kakuma refugee camp in Turkana County, Kenya. 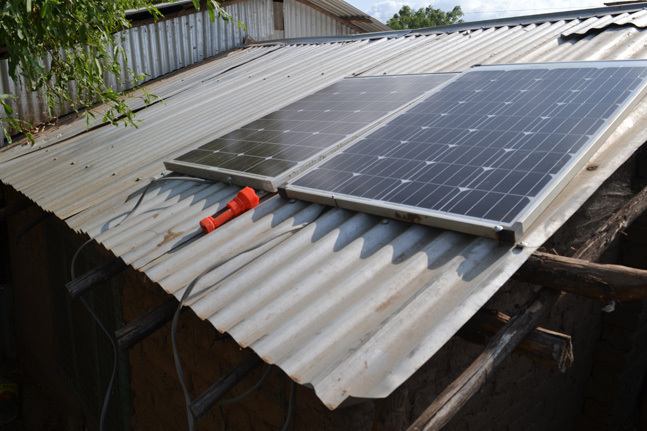 While the use of solar panels would ordinarily not be unique, Jean-Marie stands out as one of the refugees who are early adopters of solar energy. While Turkana enjoys up to 12 hours of daylight, the local community often use firewood as their main source of energy. This is gradually depleting green cover in the County. “As a barbershop owner, I had resigned to using rechargeable battery-powered shavers due to the low access to sources of electricity is common in Turkana. But these were not always efficient as I would lose some customers as I waited for the batteries to charge,” says Jean Marie. Jean-Marie is one of the beneficiaries of a Business Management and Financial Literacy Skills training facilitated by AAH-I with funding support from Energy 4 Impact (E4I). 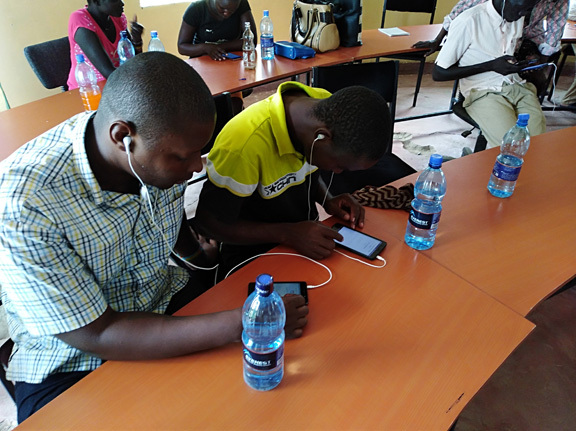 The selected trainees are solar system retailers and secondary solar energy users in Kakuma, Turkana County. The training’s key objective was to provide solar entrepreneurs and secondary users with a platform to build their entrepreneurial and financial capacity. This initiative was undertaken in partnership with the Moving Energy Initiative (MEI), a consortium between E4I, Chatham House, Practical Action, the Norwegian Refugee Council and the United Nations Refugee Agency. Training’s participants were also trained on group formation and dynamism, savings and credit, business plan development and online marketing. Jean-Marie is a 31-year-old refugee from the Democratic Republic of Congo (DRC) residing at ‘Hong Kong’ in Kakuma refugee camp. “I came to Kenya through Tanzania with my wife and four children in 2001. We were transported to Kakuma refugee camp upon arrival in Nairobi. After working as a casual staff for the Lutheran World Federation, I decided to open a barber shop in order to provide for my family’s needs”. According to the Internal Displacement Monitoring Centre’s (IDMC) 2011 Global overview, over 168,000 displacements were reported in DRC due to the ongoing conflicts and violence in the eastern regions of the country. By the end of 2017, about 4.5 million people were displaced, with over 685,000 Congolese civilians seeking refuge in neighbouring countries. The majority of them being women and children. According to United Nations Environment Programme (UNEP), Africa’s current energy production is inadequate to meet demand as about a third of the African population still lacks access to electricity despite having multiple renewable energy resources including almost unlimited solar potential. This project by AAH-I is complementing Sustainable Development Goal 7, focused on increasing the share of renewable energy in the global energy mix by improving access to affordable and reliable energy among displaced people. At the end of 2017, Kenya was host to over 400,000 refugees and asylum seekers with more than 185,000 refugees and asylum seekers residing in Kakuma refugee camp and Kalobeyi Integrated settlement at the end of January 2018.